As Christians, we want to make a difference in this world. We want to have an impact not only on our immediate family and community, but on wider social issues. We want to protect the vulnerable and engage with the issues that really matter. But how? This book shows us how wonderful, liberating and empowering it is to be made in God’s image. It will change how we see ourselves and other people. Some will feel the call to run for office… others will roll up their sleeves and join the good work of non-profit ministry… and others might simply find little ways to incorporate this vision of human dignity into their everyday lives, and change their community one word, one action, one person at a time. Dan Darling shows us that each one of us can be, and are called to be, part of this new movement—a human dignity revolution that our societies desperately need, and how we—you—are uniquely placed to join. Outro: Learning from the Zong—What Will Be Our Legacy? Daniel Darling has provided us with an accessible, faithful, understanding, Christ-centered guide to some of the most pressing ethical issues facing us today. Our God-given dignity is good news for each one of us, and this book shows us why. For years I thought that only the lives of elderly and medically fragile people were under assault—it’s what happens in a culture that insists you are "better off dead than disabled." Now, however, the human dignity of families living on every cul-de-sac in America is under attack as the very definition of "human being" is altered. No longer is this an academic issue; it’s impact is creeping into hospitals, schools, and businesses and our country is reeling. Daniel Darling’s book is a must-read for every Christian looking for a solid language and good argument to halt the further dismantling of the sanctity of all human life. I highly recommend it! To understand and address the many issues of our cultural moment, from abortion to racial injustice, we’ve got to start with the Imago Dei. The Dignity Revolution helps us recover this biblical concept, pushing and pleading with us to apply it constantly and consistently. 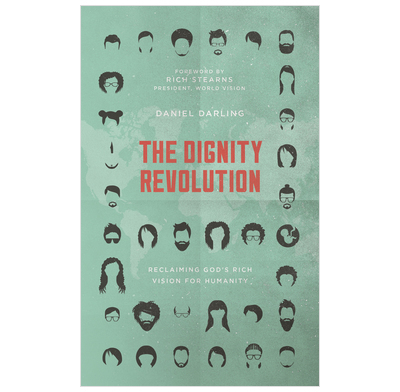 If you want to make a difference in the world then I highly recommend you read The Dignity Revolution. We might think that we believe in the dignity of every human being God has made, but sadly we all have blind spots and prejudices in this area. This book will help us to examine our attitudes and to ask God to give us more compassion and love for other human beings, regardless of age, race ability, contribution or track record. As a parent, this book has helped me to think hard about how to teach my children to value the dignity of every human life.